What is the Pilates Suspension Method? The 7-hour PSM Foundation Course sets the foundation for all the other PSM Courses. You will learn 74 essential, intermediate, and advanced level Pilates based exercises on suspension trainer. The exercises will be taught in traditional Pilates Series like the Footwork Series, Mid-Back Series, and the Feet in Straps Series. Each exercise is broken down in detail and modifications will be discussed and demonstrated. This Course includes a paperback manual and e-book version of the manual. No Pilates experience is required to take this course. This course is also approved for 7 PMA CECs and .6 ACE CECs. 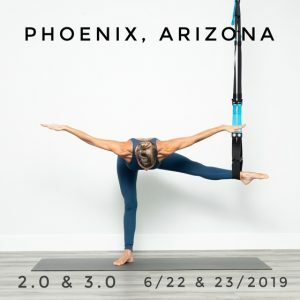 The 6-hour PSM 3.0 Course is more of an athletic approach to the Pilates Suspension Method. This course introduces 77 Essential, Intermediate, and Advanced level exercise all done in progressive series. In this course props, jump board interval inspired exercises, and yoga influences are mixed in with all the Pilates based exercises. You are NOT required to take the PSM Foundation or 2.0 Course before this course. This course includes a paperback manual and e-book version of the manual. No Pilates experience is required to take this course. This course will be approved for 6 PMA CECs and can easily be petitioned for .5 ACE CECS.